Gardeners : Containing a blend of nutrient-rich shea butter, moisturising glyercin, deodorising clover and soothing bisabolol from camomile our hand therapy will help nourish and condition work-roughened hands. Shea butter rich formula, soothes, conditions & restores softness. Citron - Honey & Coriander : Containing myrrh extracts, shown to condition nails, and Hyaluronic Acid, to hold moisture close to the skin. Fragranced with vibrant lemon, fresh coriander and a touch of sweet honey. Hydrates to improve softness. Helps condition nails and cuticles. Free of parabens, lauryl sulfates, mineral oil, and propylene glycol. La Source : Will protect and moisturise hands from the elements to leave them silky soft and lightly scented with a relaxing sea fragrance. Award winning shea butter hand cream, soothes, conditions & moisturises. Tarocco Orange - Eucalyptus & Sage : Infused with shea butter, macadamia nut oil, and extracts of Tarocco orange, bitter orange, eucalyptus and sage, this intensive cream nourishes skin so it's noticeably smoother after each luxurious use. Award-winning formula with a blend of shea butter, macadamia nut oil and ceramides. Antioxidant-rich Tarocco Orange extract conditions the skin. Hands are noticeably softer with each use. Pomegranate - Argan & Grapeseed : is an intensive conditioning hand cream that will leave hands feeling softer with each use, Conditioning shea butter macadamia nut, pomegranate, grapeseed, and argan oils to moisturise and soothe hands, myrrh to help condition cuticle and nails. Apply as needed for daily moisturising. Rosewater : Formulated with a nourishing blend of macadamia nut oil, hydrating hyaluronic acid, conditioning myrrh, ceramides to help improve skin's barrier function to reduce moisture loss, antioxidant-rich vitamin C and E, rejuvenating algae extract and revitalising bladderwrack extract. Shea butter formula, soothes and moisturises, helps maintain softness. Delicate rosewater fragrance. Have you tried anything from Crabtree & Evelyn? - I've not listed Crabtree & Evelyn as buy cruelty free for two reasons : "Some of our products have animal by-products present in the formulation (beeswax, milk by-products,& honey are examples)" (therefore not vegan). They do also use Badger hairs within the shave brushes, hair that has been confirmed that the badgers are from China and are hunted for meat. The hair is a by-product from that activity. 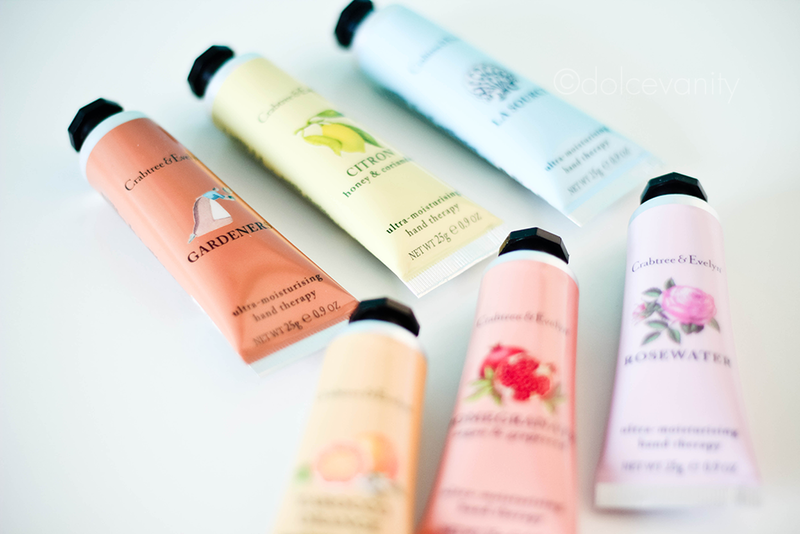 these hand creams sound amazing! I love hand creams!